Visibility Setting allow you to control what is being shown on your structure. With structures of increasing complexity (e.g. 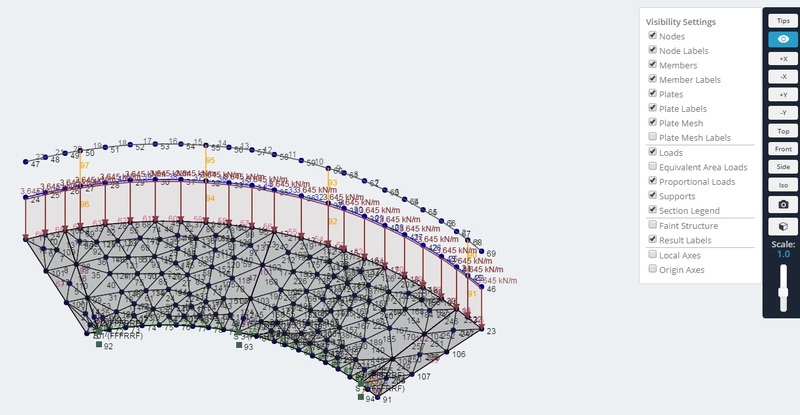 with multiple members, plates, loads), the information being presented on the structure becomes more and more cluttered. To selectively filter the information being presented, enter the Visibility Settings by clicking the 'Eye' icon on the right menu. Node Labels: which toggles the display of Node IDs. Member Labels: which toggles the display of Member IDs. Plate Labels: which toggles the display of Plate IDs. Mesh Labels: which toggles the display of Mesh IDs. Show Nodes: which toggles the display of the Nodes themselves. Show Members: which toggles the display of the Members themselves. Show Plates: which toggles the display of the Plate themselves. Show Mesh: which toggles the display of the Mesh. Faint Structure: which slightly fades the members of the structure. Loads: which toggles the display of Loads which is further broken down into your Load Groups. Local Axes: which toggles the display of a Members Local axis.